kissing the frog: Do You Know What Bullying Really Is? Do You Know What Bullying Really Is? October is National Bullying Prevention Awareness Month. Bullying is something that we talk about a lot. We talk about it in schools, in neighborhoods, in our own homes, and particularly during the current election. We hear of children being mean to each other, and we immediately call it bullying. We hear of adults being harassed in the workplace, but is it really bullying? We hear the candidates "slinging mud" at one another, but are they bullying? A sad fact of life is that human beings can be mean to one another. They can harbor prejudices, they can exclude those they don't like, and yes, they can pick on and make fun of one another. But when does it cross the line to bullying? It's about power. One person has it, the other does not. It's intentional. It's not accidentally bumping into someone or playing a game without asking everyone if they want to play. It's purposefully hurting someone or using a reason why you're excluding someone. It's ongoing. Once is just jerky; every day is bullying. It's attention seeking. Bullies usually want an audience. They want people to laugh and join in because it makes them feel cooler, better, more in control. It's sneaky. Some bullies want to torment people in secret so they can deny it later. It's unwanted, unwarranted, and unfair. Sometimes we can laugh at ourselves. Sometimes. Not everyday. It's racist, homophobic, economically or gender-driven stereotyping. It makes assumptions of who or what someone is based on certain factors. Pin it on Pinterest here. 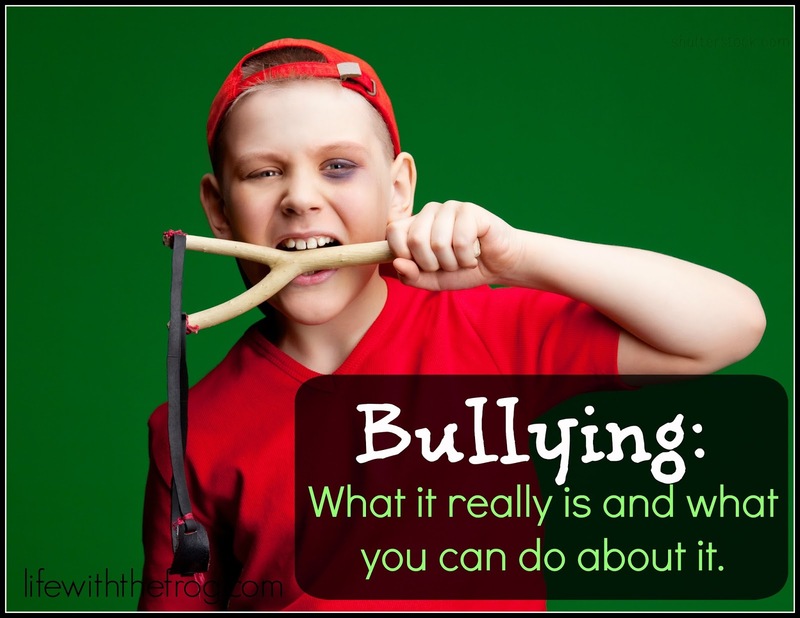 We need to be careful when we use the word "bullying." Using it for any situation in which someone is being mean diminishes the importance and urgency of what we need to teach our children about bullying. If someone is simply being mean, tell them to knock it off or walk away and find someone else to talk to. If someone didn't ask you to play, find out if you can still join the game. If someone is pointing out that your zipper is down, laugh at yourself and zip it up. Some situations have a simple solution. But bullying - true bullying - can turn dangerous. We need to teach our children how to handle themselves in three scenarios: what to do if they are being bullied, how to handle a bully they see or who wants them to join in, and how to handle feelings that tempt us to bully. Have confidence in yourself. If you do, you lessen the chances you will be bullied. Maybe you can talk it out with the person. If you can't, talk to an adult you trust - your parents, a teacher, a counselor, a mentor. Don't react. That is just what the person wants. Read more tips here on STOMP out bullying. Know that by doing nothing, you are indicating that the bullying is okay. Don't laugh, repeat what the person doing the bullying is saying, or give them an audience in any way. Help the person being bullied to get away or go get an adult. Reach out in friendship to the person being bullied. Include him or her in some of your activities. Find out more ways to help here. Take a quiz here to find out if you are engaging in bullying behavior. Think about times people hurt you and how it made you feel. Talk to someone you trust about your feelings and how you can positively change them. Know that it's easier to choose meanness and negativity. It's harder to choose kindness and tolerance. Find out how you can make positive choices here. Bullying happens in many situations and in many ways - online, workplace, sports, social organizations. One out of four children report being bullied. The percentages drastically increase among LGBTQ students. It can even turn deadly. Suicide is the third leading cause of death among young people. Many children being bullied contemplate suicide, and we've all heard the tragic stories of children who have gone through with it. If you or someone you know is contemplating suicide, get help. Bullying - whether being bullied or doing the bullying - can have lasting effects on children. Many miss school, have lower grades, drop out early, get involved with drugs and alcohol, or commit violent crimes. Bullying is a serious and complicated issue. Remember, the way our children behave, how they feel about themselves, and what they choose to do ultimately begins with us - the parents. They are going to mimic our example. Do you have any tips or ideas to share? Put them in the comments and help us end bullying.